1استاد گروه ارتباطات دانشگاه تهران. 2پژوهشگر و محقق حوزة اطلاع رسانی و ارتباطات. 3دانشجوی کارشناسی ارشد ارتباطات دانشگاه تهران. افراد به‌طور معمول با محیط پیرامون خود به مذاکرة هویت می‌پردازند و با انباشتی از یافته‌های حاصل از این مذاکره‌ها، هویت خود را شکل می‌دهند. در شرایطی که فرد در زندگی خود تغییراتی مثل مهاجرت یا روی آوردن به دینی جدید را تجربه کند، این مذاکرات به‌منظور انطباق با شرایط جدید شدت می‌یابد و به انتخاب راهبردهایی برای سازگاری با این تغییرات و رسیدن به هویت جدید منجر می‌شود. حال سؤال این است که تازه‌مسلمانان ساکن در ایران در خصوص مؤلفه‌های هویتی‌ای چون نام‌گذاری، حجاب، تفریح و سرگرمی، ارتباطات (با دوستان و اقوام)، احکام و عبادات و مسائل مالی، چه راهبردهایی را برای دستیابی به هویت جدید خود انتخاب می‌کنند؟ هویت تازه‌مسلمانانة آنها چه وجوه متمایزی نسبت به هویت قبل از اسلام آنها پیدا کرده است، در چه ابعادی هویت سابق خود را استمرار داده‌اند و چه ابعاد خاص‌گرایانه‌ای دارند؟ در این تحقیق طی دو مرحله مصاحبه‌هایی با مجموعه‌ای از این افراد صورت گرفته است که با مقوله‌بندی این مصاحبه‌ها، راهبردهای نه‌گانه‌ای در خصوص مذاکرة هویت تازه‌مسلمانان با جامعة ایران استخراج شده است. Alvi, S. (2013). Voguing the Vei:Exploring an Emerging Youth Subculture of Muslim Women Fashioning a New Canadian Identity. Ottawa. Canada: Faculty of Graduate and Postdoctoral Studies. Ameli, S. (2003). Globalization‎,‎ Americanization and British Muslim Identity‎,‎ Compilation‎. London: ‎ICAS press. Āmeli, S. R. (1383 [2004 A.D.]). Do jahāni šodanhā va āyande-ye hoviyat hā-ye hamzamān. Zamime-ye xeradname-ye hamšahri, 26, 10-11. Āmeli, S. R. (1385 [2006 A.D.]). Farhang-e mardom pasand va šahr-e mardom pasand, Tehrān šahr-e mahalli- jahāni. 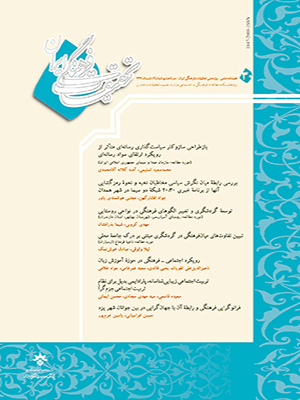 Faslname-ye anjoman-e irāni-ye motāle'āt-e farhangi va ertebātāt, No: 5, Pp: 13-50. Āmeli, S. R. (1392 [2013 A.D.]). Ravešhā-ye tahqiq dar motāle'āt-e farhangi va resāne. Tehrān: Entešārāt-e Dānešgah-e Tehrān. Beauregard, R. A., and Bounds, A. (2000). Urban Citizenship. In E. F. Isin (Ed. ), Democracy Citizenship and The Global City. London: Routledge. 243-256. Chatman, C. M.& Eccles, J. S. & Malanchuk, O. (2005). Identity Negotiation in Everyday Settings. In Downey, G., Eccles, J.,& chatman, C (Eds) Navigating the Future: Social identity, coping, and Life tasks. 116-140. Chaudhury, S. & Miller, L. (2008). Religious Identity Formation Among Bangladeshi American Muslim Adolescents. Journal of Adolescent Research. 23 (4). 383-410. Cline, T. and Abreu, G. (2012). “Silent” Monologues, “loud” Dialogues and the Emergence of Hibernated I-positions in the Negotiation of Multivoiced Cultural Identities. Culture & Psychology. December 18, 494-509. Crocker, J. S. & Major, B. (1989). Social Stigma & Self-Protective Properties of Stigma. Psychological Review. 96 (4), 608-30. Cross, W. E., & Strauss, L. (1998). The Everyday Functions of African American Identity. In Prejudice: The Target’s Perspective. edited by Janet K. Swim and Charies Stangor. San Diego: Academic Press. Deaux, K., and Ethier, K. A. (1998). “Negotiating Social Identity.” In Prejudice: The Target’s Perspective. edited by Janet K. Swin and Charles Stangor. San Diego: Academic Press. Dorudi, N., & maleki, H. (1392 [2013 A.D.]). Fetrat dar āyāt va revāyāt. Adyān va erfān, ma'refat, 187, 29-46. Erol, A. (2001).Understanding the Diversity of Islamic Identity in Turkey through Popular Music: The Global/Local Nexus. Social Compas. 58 (2), 187–202. Fakuhi, N. Hoviyat-e farhangi čist va moallefehāyaš kodāmand?.Sāyt-e ensānšenāsi va farhang, http://www.anthropology.ir/node/8409. GhazalRead, Jen’nan & Bartkowski, John p. (2000). To Veil or Not to Veil? : A Case Study of Identity Negotiation among Muslim Women in Austin, Texas. Gender & Society. Jun 1, 2000, 14, 395- 417. Golmohammadi, A. (1381 [2002 A.D.]). Jahāni šodan, farhang, hoviyat. Tehrān: Našr-e Ney. Haviland, W.A. (1993). Cultural Anthropology .Fort Wrth: Harcourt Brace Jovanovich Colloege. Javādi Āmoli, A. (1381 [2002 A.D]). Tafsir-e mozu'i-ye Qorān-e karim (surat va sirat-e ensān dar Qorān). (2nd ed.). Qom: Asrā'. Jenkins, R. (1381 [2002 A.D.]). Hoviyat-e ejtemā'i. (Persian translation of Social identity), translated by Yār Ahmadi, T. Tehrān: Entešārāt-e Širāze. Jian Sin, W. (1384 [2005 A.D.]. Negāhi be vaz'iyat-e mosalmānān-e Žāpon. Čašmandāz-e ertebātāt-e farhangi, 19, 51-55. Khan, Z. (2000). Musilim Presence in Eurpupe: The British Dimension – Identity, Integration and Communication Activism. Current Sociology. 48 (1). 28-40. http://csi.sagepub.com/content/48/4/29. Kuppinger, P. (2013). "Multiethnic Urban Cultures in Germany." Space and Culture, 17 (1), 29-42. Lindlof, Thomas R., & Taylor, Bryan C. (1388 [2009 A.D.]). Ravešhā-ye tahqiq-e keyfi dar olum-e ertebātāt. (Persian translation of Qualitative communication research methods), translated by: Giviyān, A. Tehrān: Hamšahri. Mazāheri, M., & Hoseynzādegān, Z. (1390 [2011 A.D.]). Barresi-ye ta'sir-e resānehā-ye jahāni bar hoviyat-e farhangi-ye javānān. Motāle'āt-e rāhbordi-ye jahāni šodan, 2 (5), 39-62. Mostafavi kāšāni, L. (1379 [2000 A.D.]). Ahvāl-e ensān-e qarbi. Tehrān: Markaz-e Pažuhešhā-ye Bonyādi. Negāreš, H. (1380 [2001 A.D.]). Hoviyat-e dini va enqetā'-e farhangi. Tehrān: Namāyandegi-ye Vali-ye Faqih dar Sepāh. Pavlenko, A. (2001). In the World of the Tradition, I was unimagined': Negotiation of Identities in Cross-cultural Autobiographies. International Journal of Bilingualism, 3, 317-344. Pedziwiatr, K. (2011). How Progressive is " Progressive Islam"? The Limite of the Religious Individualization of the European Muslim Elites. Social Compass. 58 (2). 214-222. Samovar, L., Porter, R., & Stefani, L. (1379 [2000 A.D.]). Ertebāt-e beyn-e farhang hā. (Persian translation of Communication between cultures), translated by kiyāni, Gh., & Mirhoseyni, A. Tehrān: Entešārāt-e Bāz. Sartawi, M. and Sammut, G. (2012).Negotiating British Muslim Identity: Everyday Concerns of Practicing Muslims in London. Culture Psychology. 18, 559- 576. Scourfield, J. […et al] (2012). The Integenerational Transmission of Islam in England and Wales: Evidence from the Citizenship Survey. Sociology. 46(1). 91-108. Šeyxāvandi, D. (1380 [2001 A.D.]). Nāsiyonālism va hoviyat-e dini. Tehrān: Markaz-e Bāzšenāsi-ye Eslām va Irland. Shell, G. R. (2006). Bargaining for Advantage. New York: Penguin Books. Skandrani, S. M. & Taı¨eb, O. & Moro, M. R. (2012). Transnational Practices, Intergenerational Relations and Identity Construction in a Migratory Context: The Case of Young Women of Maghrebine Origin in France. Culture & Psychology. 18(1), 76–98. Smiith, H., (1991). The World's Religions .New York: Harper Collins. Snyder,W.E. (2003). Perseptions on the Diffusion and Adoption of Skill Soft, an e-Learning Program: A Case Study of a Military Organization, Dissertation Ph.D. at http://scholar.lib.vt.edu/theses/. Statham, P. […et al] (2005). Resilient or adaptable Islam?'. SAGE Publications. 5(4), 427-459. Strauss, A., & Corbin , J. (1390 [2011 A.D.]). Osul-e raveše tahqiq-e keyfi: Nazariye-ye mabnāyi, raviyehā va šivehā. (Persian translation of Basics of qualitative research: techniques and procedures for developing grounded theory), translated by Mohammadi, B.). (3rd ed.). Tehrān: Pažuhešgāh-e Olum-e Ensāni va Motāle'āt-e Farhangi. Tājbaxš, X., & Āmeli, S.R. (1390 [2011 A.D.]). Pažuheši dar zamine-ye hoviyat-e mosalmānān-e ši'i-ye beritāniyāyi. Faslnāme-ye ši'e šenāsi, 36, 7-34. Thomas, P. & Sanderson, P. (2012). Unwilling Citizens? Muslim Young People and National Identity. Sociology. 45, 1028–1044. Vanoli, A. (2013). The Muslim world and the Italian identity: New directions for historical research. Forum Italicum. 47 (2), 423-430. Wagner, W. [… et al] (2012). The Veil and Muslim Women's Identity: Cultural Pressures and Resistance to Stereotyping. Culture & Psychology. 18 (4), 521–541. Xomeyni, R. (1376 [1997 A.D.]). Tozih ol-masāel. Mašhad: Entešārāt-e Hātef.